Why should I worry about oral cancer? Dentists spend a lot of time looking in your mouth which gives them an excellent opportunity to screen for oral cancer. Oral cancer accounts for 1% of all cancers worldwide. While more prevalent in smokers, oral cancer can develop in non-smokers regardless of your age. Like most other cancers, the key to successful treatment of oral cancer is early diagnosis. An oral cancer screening is a great way of finding early symptoms of while the cancer is still in a treatable state. 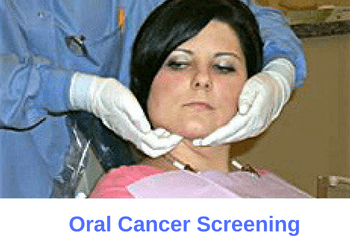 How do you perform an oral cancer screening? During our visual oral cancer screening we look for suspicious looking lesions. We start by examining your head and neck region. Next, we examine the inside of your mouth such as your cheeks, tongue, palate and gum areas. Cancerous and pre-cancerous lesions typically appear as a red or white spot inside your mouth. These lesions typically have undefined, raised borders and occasionally demonstrate ulceration as well. Our manual oral cancer screening includes palpation of your head and neck region. Since oral cancer travels through the head and neck lymph nodes, it’s important to examine this area carefully. We feel for any firm or swollen lymph nodes that may be a warning sign. During your exam, we palpate your occipital, postauricular, preauricular, anterior cervical, posterior cervical, supraclavicular, submandibular and submental lymph nodes. Suspicious nodes typically manifest themselves as a firm and non-tender nodule. What happens if a suspicious lesion is detected? If we find a suspicious looking lesion or node we immediately make a note of it and inform you of our finding. Based on the appearance of the lesion and your risk levels, we recommend biopsy or two week follow-up. Should the same lesion or nodule persist after these two weeks then a biopsy must be performed. For our biopsy we either perform a brush biopsy or make appropriate referral for further evaluation of your lesion. A visual exam did not show any signs of cancerous lesion. By shining Bio/Screen light, a potentially suspicious lesions is detected. One of the technologies we use to screen for early cancerous and pre-cancerous lesions is known as the Bio/Screen. Bio/Screen is an oral cancer detection tool which emits a blue light. 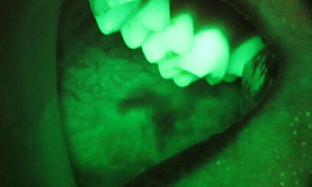 This blue light is designed to detect subtle changes in our gum tissue which are invisible to the naked eye. Using Bio/Screen helps detect lesions which are invisible to the practitioners naked eye. If we detect a suspicious lesions using Bio/Screed, we will make followup recommendations or perform a biopsy. If you need to have an oral cancer screening then give us a call today. Contact us by calling (949) 481-2540 or book your appointment online. As part of your new patient exam we will perform our visual and manual oral cancer examination. We will look for any suspicious cancerous or pre-cancerous looking lesions. Additionally, we will review your risk factors and make recommendation to help reduce your chances of developing oral cancer. If you have any questions regaring oral cancer diagnosis feel free to contact us.